can be a time of Tribulation! Preparations to go RV Boondocking. Wow! More big words from a broken down ol' cowboy. But it's true. Those preparations can make for a pretty traumatic time. This page is mostly for new RVers. Though maybe it will offer some food for thought for some of the old timers. Stepping out of the old ways and into the new can be just a mite spooky.You just don't really know what to expect. You know what you want, but you just aren't absolutely positive what your preparations to go RV Boondocking are going to yield! My advice is don't wait too long. Start your preparations to go RV Boondocking at the earliest opportunity. Take little steps. Gain some experience gently! Not the way I've seen other unfortunates get their RV "wings". I see a lot of folks wait, or at least decide to "Go RV Boondocking" pretty late. They buy a 40' diesel pusher 4 days before they retire and take off for the west! Tell me this ain't grief just waiting to come a calling! This is about the time you hear "Hey Ethel, this thing just don't stop like that old KIA Sorento you used to have!" Or "Look out for that .................CRUNCH!................. light pole, Herman!" They've never driven anything larger than that old "Sorento" and got talked into their big shiny rig by a slick talking salesman at the local RV Show. Preparations to go RV Boondocking? never gave it a thought. They don't know dump valve from landing legs. Leveling? Winterizing? No-one ever told them the rig only gets 4mpg and needs 40 acres to turn around. Those guys take their money, hand 'em the keys and say "Bye!". Poor folks are left to learn the hard way. It just ain't right. They should have been helped and guided by those making so much money from them, to make proper preparations to go RV Boondocking. Take it slow at first. Talk to folks on the internet forums and out in the campgrounds. Rent a couple rigs for short trips. Find out what style of rig suits you, and fits you the best. Motorhome? Class A? Class C? Fifth Wheel? There's a lot of choices and a lot of things to think about. Learn about all the maintenance things you'll need to be doing, living in and using your rig. There are even driving classes available through a number of places (Good Sam Club and Escapees) to get you started properly, and safely. You'll be driving a rig maybe 10 times the weight of your old car, and darn sure wider and longer! Heck there's even general RV classes about living in your rig!You might even find one titled Preparations to go RV Boondocking! Make a lot of short circles, gaining experience and confidence. Don't let your dream be ruined by a bad experience that comes only from a lack of experience. Go get the experience! We all started right where you're at. We all had to learn. One thing that you'll find is that most RVers are only too happy to help you out, or give you some RVer "secrets" to help you enjoy your travels. All you need to do is ask! The internet is filled with RV Forums where you can collect the answer to pretty much any question you might have. Just be advised. There are a lot of "Ford - Chevy" type arguments on those forums! So just be prepared to see a little bit of "passion" on occasion, muddying up the answer. And of course there's always that fella who thought he made a mistake once, but quickly realized he was mistaken! I talk to folks all the time. They've been out on the road for a year or so, and are miserably unhappy. Lack of preparation left them swingin' in the breeze when they were confronted by unexpected difficulties. Their "great adventure" got converted into "the unending nightmare". They bought their rig and took off without a thought about any of the "what ifs". *what if we blow a transmission on this used rig with no warranty? .............. a heavy hit if an emergency repair fund wasn't set up in advance to deal with such eventualities. *What if this shiny big coach gets stuck in the mud up some little road on the back side of beyond? A several hundred dollar towing bill, if you didn't have emergency road service set up before hand! So now they are disheartened and weakened financially. Their rig is busted. Their wallet is depleted and they aren't having the fun they expected. It's getting sucked up by their "difficulties". They can't travel much because they were unprepared for a lot of what might happen. All they can do is sit in a parking place they can afford and look at each other. I realize just looking at me might be pretty pleasant ................. but everyone can't be so lucky! You don't need to and can't plan every minute of every day or for every possibility. Far from it. That would be an awful thing anyway! But do get your affairs in good order. Prepare for the unexpected eventualities. Replacing a blown transmission will never be a pleasant thing, but if you are properly prepared it need not be a crushing catastrophe. It will be a lot less painful if you have an emergency fund set up. If you are properly educated, you may not blow that transmission in the first place! You'll just leap right over those bumps in the road and keep on RV Boondocking if your preparations to go RV Boondocking are pursued with enthusiasm! So, follow your heart and chase the dream. RV Boondocking is an absolute joy. I swear. Just start now, don't wait. 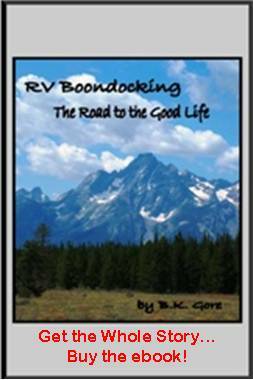 Make good, solid preparations to go RV Boondocking and you'll be ready, no matter what happens down the road.